Record labels have taken some flickering interest in Lithuanian musical pioneer Mikolajus Čiurlionis. Naxos delved into his piano music across two discs (review ~ review) courtesy of the excellent Mūza Rubackytė. This was first issued on Marco Polo in 1994. Pianist Vytautas Landsbergis (b.1932), one-time Lithuanian head of state, recorded a selection of Čiurlionis's piano music in 1998. This was issued on EMI Classics 7243 5 66791 2 2 under the title Born of the Human Soul. This beautifully presented disc used the composer's painting "Fairy Tale Castle", half surreal, half Edmund Dulac, for the front cover. Landsbergis returned to the project in 2009 with two CDs issued by the Lithuanian National Philharmonic Society. That's not the end of the story. The Celestial Harmonies label have a fine 5 CD set (19923-2) of the complete piano music played by Nikolaus Lahusen and Rokas Zubovas. This was recorded in Bavaria (1999-2008). As for the orchestral music The Sea, In the Forest and five Preludes were issued by Marco Polo (8.223323) in performances by the very same Juozas Domarkas conducting the Slovak Philharmonic. As far as I can see this has not been reissued on Naxos. The Sea also attracted Evgeny Svetlanov. The present two discs, which are only available separately, contribute uniquely to the Čiurlionis experience even if the composer's short life and output limits the playing time to either side of 50 minutes. The orchestral disc presents works of nationalist-late-romantic extravagance. The Sea is for large orchestra including organ and two harps. In the Forest leans towards Strauss at one moment and at others takes tints from Grieg (5:49) and Tchaikovsky (2:48, 7:19). The music is strong on sighs and swells but avoids tempest and torment. It has no Rimskian colour. This score is not as classically domesticated as the charming String Quartet which was written at about the same time. Čiurlionis discursively spins atmosphere in the manner of Danish composer Ludolf Nielsen's tone poems. The Sea is more emotionally imaginative and imperious. The marine swell is suggested but then so are sea-hunts (4:45) and supernatural beings benign and malign. Listen to the whoop of the horns at 15:14. Silky contentment is in the weave too (21:00) as well as lulling consolation in fate (24:00). Nor does Čiurlionis shrink from the occasional Lisztian stramash (12:40); bombast seems not have frightened him and he ends the piece with a blaze of sound. This is no impressionistic score in the manner of Bax in his later Spring Fire - but it has its magnificent moments and is richly coloured in Rimskian style at times. More airily orchestrated than the Morawski tone poems this time the composer is a closer match for Novak's About the Eternal Longing (1904) and Karlowicz's Returning Waves (1904) and Eternal Songs (1907). The De profundis cantata is a taut eight minute work setting Psalm 129 "From the depths of my despair". It is sung with the warm glow of intensity and sincerity that rescues it from one rigid fugal section. It was written for his graduation from the Warsaw Conservatoire. 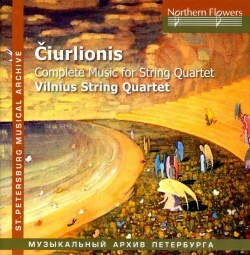 Čiurlionis makes inventive and nicely variegated use of the mixed choir. It is by no means a work of bombast and Čiurlionis has the courage to end it in reverential confidence rather than the knee-jerk blare of The Sea. The work was premiered in 1912 in St Petersburg at a concert which also included In the Forest. The cover adroitly uses the composer's painting: "Sonata of the Sea" which has a lapidary Klimt-like style. The string quartet music is played by a Lithuanian quartet whose sympathy and delicacy help this unfamiliar music thrive. They are warmly recorded but with a sense of space nicely captured. The three movement String Quartet is a gracious romantic work with the air of very early Sibelius, Grieg and Smetana. It was written while he was studying in Leipzig. His sweet-tempered writing is utterly charming if not specially personal. The inventive Theme and Variations date from his Warsaw Conservatoire years and are in much the same style as the Quartet. The trilling Agitato variation (tr.11) and the bustling Dvorak-like Allegro (tr.15) stand out in this agreeable work. The first of the two canons shows an increased depth and a darker emotional tint - not at all dry-as-dust. However the two Fugues while nicely crafted do have an academic demeanour. The liner notes in English and Russian Cyrillic script are well constructed and decently cover the factual backdrop; likewise for the orchestral disc. The cover uses one of the composer's imaginative paintings: "Paradise". These two discs concisely present the charms of a late-romantic nationalist. If you can run to only one of these then the striking opulent orchestral disc is the one to choose.